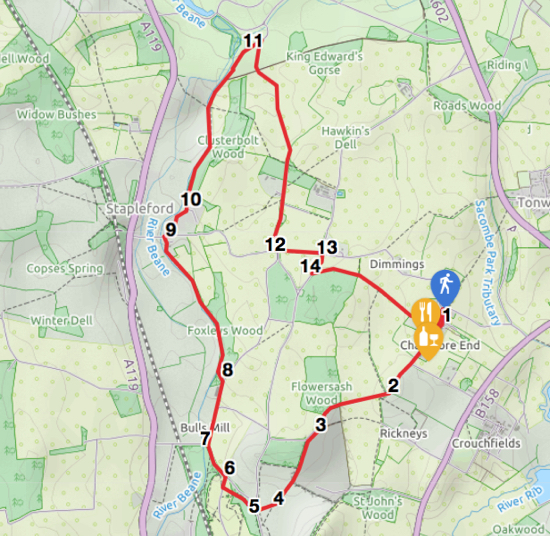 A lovely, undulating circular walk through woodland, a nature reserve, along a quiet river, across parkland, and with great views across the Hertfordshire countryside. Park in the village of Chapmore End. A good spot is up by the duck pond. Refreshments are available at The Woodman pub and the Buttercup Tearoom. Check opening times to avoid disappointment. Head south-west through Chapmore End until you reach a sharp left bend. Here you go straight ahead along a bridleway continuing south-west. The path bends slightly, and eventually reaches a five-way split. You carry on straight, heading west towards the distant woodland. When you reach a footpath junction, take the path on the left (straight ahead) which dips down into the old quarry and then climbs up the other side to reach Sacombe Road. Cross the road and enter the Waterford Heath Community Nature Park directly opposite. Once in the reserve, turn right and head north-west keeping the fence and Bullsmill Lane on your right. Look out for some wooden steps on your left. Go down the steps. At the foot of the steps turn right and follow the path until it reaches Bullsmill Lane. Turn left and walk along Bullsmill Lane until you reach a lane on your right, which is just before the small bridge over the River Beane. Take this lane and head north. The lane eventually becomes a bridleway at the point where it veers right. 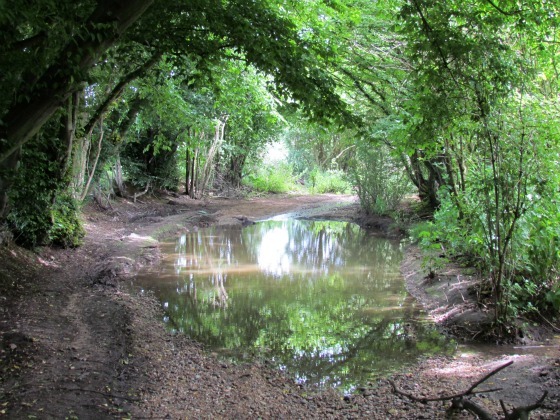 You continue along the bridleway heading north looking out for a path on your left that dips down to the River Beane. This is the Hertfordshire Way. Take this path and continue heading north. You eventually reach Stapleford and emerge in the churchyard and then on Church Lane. Turn right then immediately left on Clusterbolts. Continue along Clusterbolts until you reach the last house. To the left of the house you will see a path and a sign hidden in the hedgerow which reads "Hertfordshire Way". Take this path heading north with the River Beane on your left. 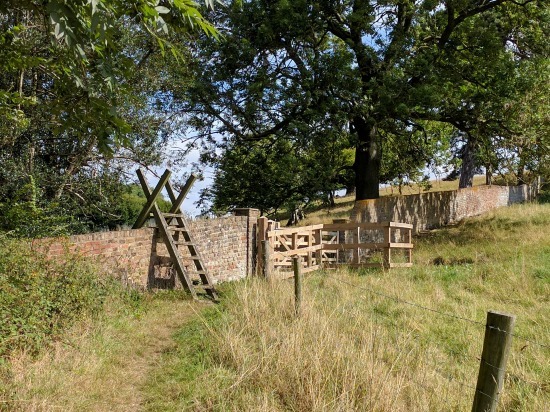 This is a pretty path which follows the river north, until it reaches a stile and a wooden gate (see image above). Go through the gate and continue across parkland and through a metal gate until you reach a gravel road by a bridge. Turn right on this gravel road and follow it south as it climbs towards Stapleford. Take the third path on your left at the junction with a lane which goes off to your right. Cross a field and emerge to the right of a house on Stony Hills. Turn right heading south along Stony Hills until you reach a path on your left just before woodland on your left. Take this path and follow it at first with the woodland on your right and fields on your left until it opens up at the end of the woodland. Continue straight, heading south-east with the hedgerow on your left and the field on your right until you return to Chapmore End.